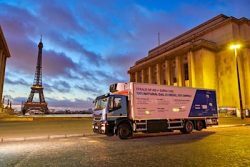 SITL, France’s major transport, logistics and supply chain solutions trade show, is home to the French Association for Natural Gas for Vehicles (AFGNV) this week. 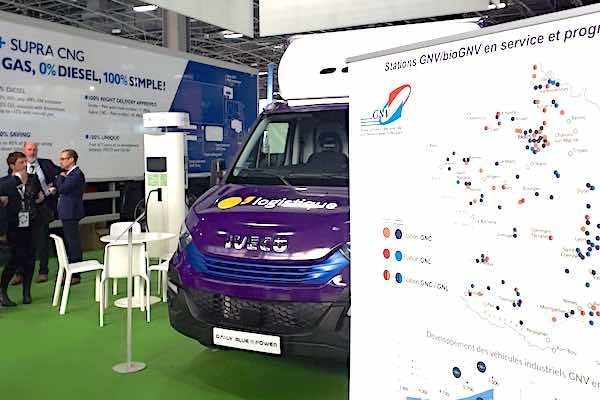 There is renewed interest in France in the use of natural and renewable gas for transportation and IVECO is displaying its related product at the AFGNV pavilion. IVECO, a European leader in natural gas for transportation, confirms its strong commitment to sustainable transport and clean energy by exhibiting two vehicles in the space reserved for members of AFGNV: a Stralis NP truck outfitted with a refrigeration unit for the safe transportation of food products, and a Daily Hi-Matic Blue Power NP commercial van. Unlike standard trucks for the refrigerated transport of food products, which are equipped with two diesel engines – one for the truck, the other for the compressor of the refrigeration unit – this Stralis NP uses only compressed natural gas (CNG). Both the vehicle and the refrigeration unit are powered by natural gas stoichiometric engines equipped with 3-way catalysts. This solution also has the advantage of much quieter operation: the Stralis NP is Piek Quiet Truck certified – 71 dB(A) and the Supra CNG refrigeration unit is Piek certified – 60 dB(A). These low emissions and noise levels are undeniable assets for night deliveries in urban areas. Another major advantage is the low total operating cost obtained thanks to savings of around 40% on fuel costs compared to diesel and an optimized maintenance interval of 75,000 km. Gas supply is via a single easily accessible orifice. In terms of range, the truck can travel up to 1,000 km on open roads without refuelling, or perform up to 6 driver rotations before passing through the pump. The Carrier refrigeration unit is supplied with gas from dedicated CNG tanks mounted in the factory. Thanks to the autonomous operation of the refrigeration unit, it is not necessary for the vehicle engine to be switched on to supply energy to the refrigeration unit. From 80 to 526 L of CNG can be reserved for the production of refrigeration energy to cover the needs of all types of missions. A power supply is also possible when the vehicle is at berth. Delivered to the Casino Group as part of the development of its home delivery business, this vehicle is designed to optimize the logistics of incoming and outgoing customer orders in temperature-controlled urban distribution. Combined with the many advantages of natural gas engines, this technology makes it possible to guarantee quieter and more environmentally friendly transport. Casino Group has acquired 90 Daily NPs as part of the development of the Casino Group’s home delivery business. These utilities are equipped with a dual-temperature cold box and will gradually come into service in 2020 for operation in the Ile-de-France region. Thomas Ors, Casino Group Transportation Project Director, explains the rationale behind the purchase: “We had to find a solution that would allow us to anticipate regulatory developments, which is economically relevant to diesel and which allows total versatility in terms of distribution channels. All without constraints for our operational activities with the widest possible autonomy and strong carrying capacity.” These comments were delivered during a discussion organized by GRDF at the SITL. The Daily Hi-Matic Blue Power NP, voted “International Utility of the Year 2018”, is well suited for city-centre operations were environmental sensitivities demand the best from vehicle performance. Extremely quiet when compared to its diesel equivalent, it is also perfectly suited for night deliveries. Regarding emissions, it produces 76% less fine particulate matter and 12% less nitrogen oxide than the equivalent diesel engine. In real urban operating conditions, CO2 emissions are 3% lower. The application of Hi-Matic transmission to natural gas further improves this performance by widening the gap by up to 5%. Again, in the case of biomethane use, the reduction in CO2 emissions can even be increased to 95%. The Hi-Matic gearbox also offers fuel savings of up to 2.5% over a real urban cycle compared to a manual gearbox. The lower price of CNG at the pump means a very competitive cost per kilometre. The savings generated on the fuel costs can exceed 40% compared to a diesel vehicle. * Supra CNG’s results and all technical data are based on the comparison between the Supra® compressed natural gas engine unit and a Supra® 1250 running on diesel engine. ** Iveco Stralis NP results and all technical data are based on the comparison between the Stralis NP CNG-powered engine and the Stralis diesel Euro VI.